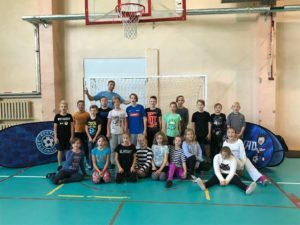 Spordinädala lõpetuseks käisid meie 1.-5. klassi õpilastel külas Eesti Jalgpalli Liit, kes mängisid õpilastega mõned mängud, õppisid trikke ja muidugi mängisid ka jalgpalli. Kingituseks tõid nad meie koolile erinevad jalgpallid. Oleme kingituse ja külaskäigu eest väga tänulikud! Being German one would think that I have a special grasp of football. Well, I don’t, I realized today a few minutes in the training after I was given a ball to participate in doing tricks. Actually, a few of the first and second graders did better than me. While I was struggling to uphold my reputation and the one of German football, I saw that the kids had a lot of fun in trying their best at every trick and every game (even if sometimes someone was a little bit out of it). Probably because the professionals had the patience to deal with a bunch of energetic kids and the talent to direct that energy into playing football. Probably also because they had a way to explain everything in a way interesting for children their age. Personally, I think that also having a man and a woman there to give the kids a better understanding of football helped to motivate the especially girls for it showed them that football is a sport for everyone. 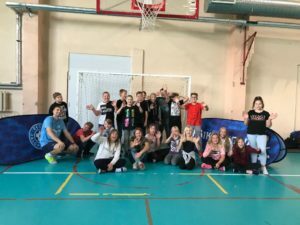 Some of them showed an actual affinity for this kind of sport and we’ll see, perhaps this training motivated some to pursue a hobby or even a career in football or similar sports. This entry was posted in Määratlemata on 28. sept. 2018 by Ester Rodima.